Groundbreaking! All photos courtesy Green Light Photography. Lost in the middle of the desert, you’d be hard-pressed to find water. But at the edge of the Sonoran Desert in sunny Scottsdale, Arizona, you’ll find an oasis of hope where the Living Water is in full supply. For years, desert-dwellers have made their way to this oasis, quenching their spiritual thirst on the unconditional love Jesus, and telling others where they can find water. The road to a healthy, growing church has been dusty at times, but God has blessed every mile. Now McDowell Mountain Community Church faces a new kind of problem—a good kind of problem. They need more space! 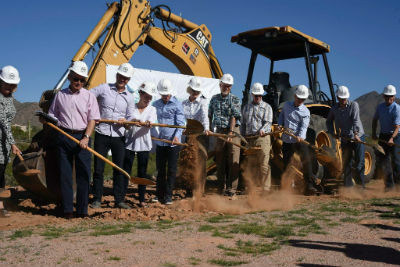 Photo: Mark Krenz at the groundbreaking ceremony. It’s a good problem faced by many of our growing congregations. 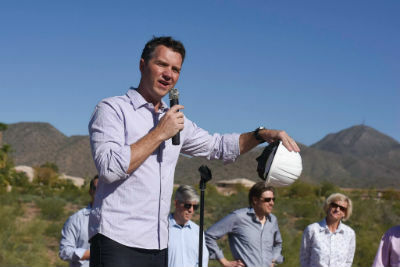 For McDowell Mountain, expansion was always the confident expectation. “Multiply” has been the rallying cry of the expansion campaign, which began with Phase One in 2006, resulting in a worship center and lobby, as well as some classrooms and offices. Ten years later, the existing facility can’t contain what God is doing—nor could it ever, as the four walls only provide a gathering place where disciple-makers are launched into the community. Phase Two brings improvements to the children and youth areas, adds 25 percent more seating and parking capacity, opens up the lobby space—which will include the construction of a new café—and repurposes vacated children’s classrooms. 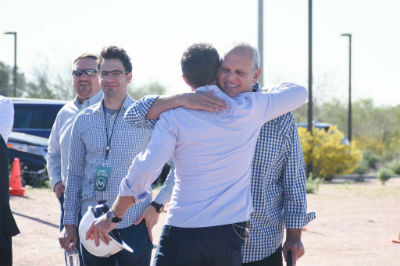 Photo: Mark embraces founding pastor Don Doe. In the future, Phase Three is expected to add a few hundred more seats, a new administrative area, and a new student ministry/multipurpose center. This entry was posted in All Church of God, Western and tagged Arizona, church, church multiplication, Don Doe, expansion, Green Light Photography, growth, health, Mark Krenz, Matt Anderson, McDowell Mountain Community Church, Phoenix, Scottsdale, Southwest. Bookmark the permalink.